March is Women’s History Month, and this year’s theme is “Celebrating Women of Character, Courage, and Commitment.” While other entertainment mediums may have heroines that raid tombs and kill Bills, comic books have the deepest bench when it comes to powerful women. 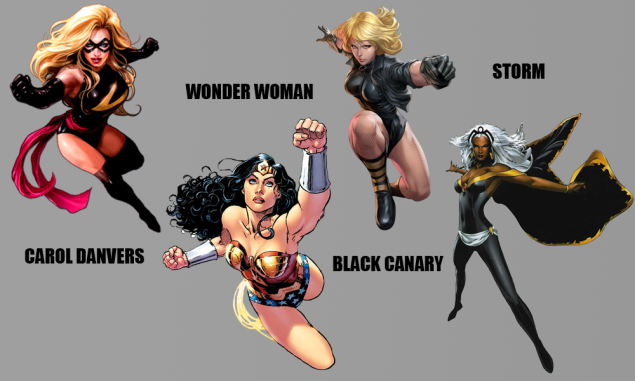 Here are a few of our favorite female superheroes! Carol Danvers was an officer in the USAF when she encountered the Kree superhero Captain Mar-Vell. When Danvers is kidnapped by the villainous Yon-Rogg, Mar-Vell was able to rescue her, but not before she received serious injuries. Years later, Danvers reappeared as the superheroine Ms. Marvel, gifted with superhuman abilities after her Kree encounter of the third kind. She had many adventures under several pseudonyms and with super-teams including the Avengers and the X-Men before finally taking up the mantle of Captain Marvel herself. Ororo Munroe’s life has taken a strange course, from street orphan to goddess to superhero to queen, Storm has one of the most storied careers of any hero. With her complete dominion over all things meteorological, Storm has served as both a valued member and team leader of various super-groups, including the X-Men, Avengers, Fantastic Four, and the Morlocks. Recently, she formed a new X-force as well as an all-female X-Team. As the daughter of Zeus and the Amazonian Hippolyta, Diana was blessed with divine powers rivaling those of even the most powerful metahuman. Furthermore, she was trained by Ares himself in all forms of combat, making her the most skilled warrior on Earth. Wonder Woman is a co-founder of the Justice League of America, and has been a mainstay of the team since its inception. After the “Crisis on Infinite Earths” and before the New 52 reboot (comics are complicated), Dinah Lance took up her mother’s heroic identity of Black Canary using her “Canary Cry,” a super-sonic scream granted to her by a metagene. Black Canary is also one of the world’s foremost martial artists, with mastery over many forms of hand-to-hand combat. Throughout her superheroic career, Black Canary has served as a member of the Justice League and the Birds of Prey, and is also known for her relationship with fellow crime-fighter Green Arrow. Which of these heroines is your favorite? YOU can vote below now to decide! My favorite superheroine has to be She-Hulk. Smart, beautiful, sarcastic, funny, AND powerful, She-Hulk’s got it all. The most powerful superheroine has to be Susan Storm Richards, AKA The Invisible Woman. Her mentally created force bubbles make her one of the most powerful beings in the cosmos.